Laboratories need to be more flexible than ever and need LIMS to support that ability. Our LIMS are configured, not customized to meet the needs of your laboratory today and tomorrow. With built in data integrity and security features, you can easily manage your lab data, resources and workflows and drive automation by connecting your instrumentation and systems through open standards. You drive your lab, we just make it easier. Thermo Fisher™ SampleManager LIMS™ software is the most widely deployed LIMS in the world for a reason – it’s more than just a LIMS. Its lab execution and scientific data management capabilities make it three systems in one. SampleManager LIMS software is configured to model your business process guiding users step by step through your standard operating procedures (SOPs) and methods. This powerful LIMS enables compliance with Good Manufacturing Practices (GMP), ISO 17025 and the latest data integrity guidance documents. Thermo Fisher™ Watson LIMS™ software is used by the top 20 global pharmaceutical and biopharmaceutical organizations and CROs to manage their bioanalytical workflow. It enables compliance with Good Laboratory Practices (GLP), 21 CFR Part 11 and data integrity guidances. Watson LIMS software supports both small and large molecule workflows through its comprehensive support for LC/MS and immunogenicity assays. Developed in partnership with customers in fast-paced R&D environments, Thermo Fisher™ Nautilus LIMS™ software is a highly flexible, easily configurable system. Nautilus LIMS software models business processes through workflow technology. Increase your lab’s efficiency while ensuring data reliability, sample traceability and regulatory compliance. The Thermo Fisher™ Platform for Science™ software is a flexible, extensible, cloud-based platform helping you to easily collect, store, access, share, and use your scientific data. Designed from the start to run on the cloud, the Platform for Science’s services and compute power can scale along with your needs. All products and application-based solutions work together on top of the platform, preserving a single point of truth for all of your data. All changes to Platform for Science solutions are done through configurations, not custom code, and are immediately available across the platform. Our solutions help you to meet your specific analytical, regulatory and reporting challenges across life science and process industries. 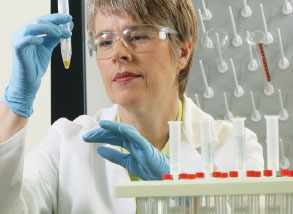 The world’s leading companies rely on our LIMS to drive their laboratory operations. Shorten deployment times and achieve your return on investment (ROI) faster with our industry solutions. Informatics solutions from Thermo Fisher Scientific can power innovation and ensure that operational excellence is the rule, rather than the exception in your organization’s lab operations.